Experience the glorious show of two-tone flowers that make this Australian native a garden must-have. Covered in clusters of extraordinary two-tone, tubular pink flowers with wide, yellow or bright green petal margins, this is a plant that has to be seen to be believed! Correa 'Marian's Marvel', or the Australian Hardy Fuchsia, is a spreading, evergreen shrub with reddish-brown stems with oval, dark green leaves. Holder of the RHS Award of Garden Merit you can be sure that it has been trialled and recommended as a plant worthy of growing and sure to perform in your garden. Easy to grow in full sun and will grow in well drained fertile soil which is acid to neutral. 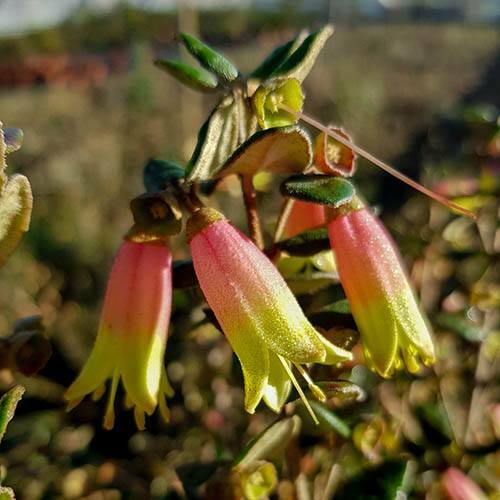 Correa 'Marian's Marvel', or the Australian Hardy Fuchsia, is a tender, spreading, evergreen shrub with reddish-brown stems bearing oval, dark green leaves and clusters of tubular, pink flowers with wide, yellow or bright green petal margins. The bicolour flowers are a sight to behold and hang like tiny bells from October right through to March in ideal conditions. Holder of the RHS Award of Garden Merit you can be sure that it has been trialled and recommended as a plant worthy of growing and sure to perform in your garden. Correas like full sun and will grow in well drained fertile soil which is acid to neutral. If grown in pots, they prefer ericaceous compost and full light with protection from direct sun and also from drying winds. Water sparingly through the winter, even when in flower. Supplied as an established plant in a 5L pot, ready for immediate planting. Supplied as an extablished plant in a 5L pot ready for planting out. Grow in full sun and provide winter protection from frost. Grows to approx 2m tall x 2m wide. Tolerant of low temperatures, plants can withstand temperatures down to 1°C (34°F) but will not survive being frozen. Correa is easy to maintain and can be pruned lightly in April/May to encourage a good shape.